Aquaclean Tar, Glue & Adhesive Remover is a hydrocarbon based formula containing no chlorinated solvents or methanol. 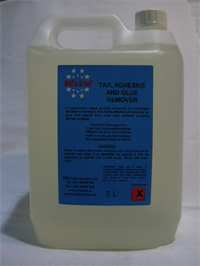 It is highly effective at removing tar, glues, rubber and adhesives from most hard surfaces including painted surfaces. Can also be used as a spot cleaner on fabrics (after testing for colourfastness) to remove grease, oil and other stubborn stains. Spray or apply with a cloth undiluted onto the surface to be cleaned and allow it to penetrate the soiling. It may be necessary to agitate with a soft brush. Rinse thoroughly with clean water. Always check first that the surface is suitable and that any colours will not run or fade.